VANCOUVER, BRITISH COLUMBIA--(Marketwired - Jan. 16, 2014) - Skyharbour Resources Ltd. (TSX VENTURE:SYH)(PINKSHEETS:SYHBF) (the "Company") is pleased to announce it has entered into an Assignment and Novation Agreement (the "Agreement") with Triex Minerals Corp. ("Triex"), a wholly owned subsidiary of Canterra Minerals Corp. ("Canterra"), whereby Skyharbour will acquire Triex/Canterra's 60% interest in the Mann Lake Uranium Project (the "Property"). The property is strategically located on the east side of the Athabasca Basin approx. 25 km southwest of Cameco's McArthur River Mine and 15 km northeast and along strike of Cameco's Millennium uranium deposit. Under the terms of the agreement, Skyharbour will pay $15,000 in cash and issue one million common shares in consideration for Canterra's 60% interest and their option to purchase up to 1.5% of the property's underlying 2.5% NSR for $1.5 million. 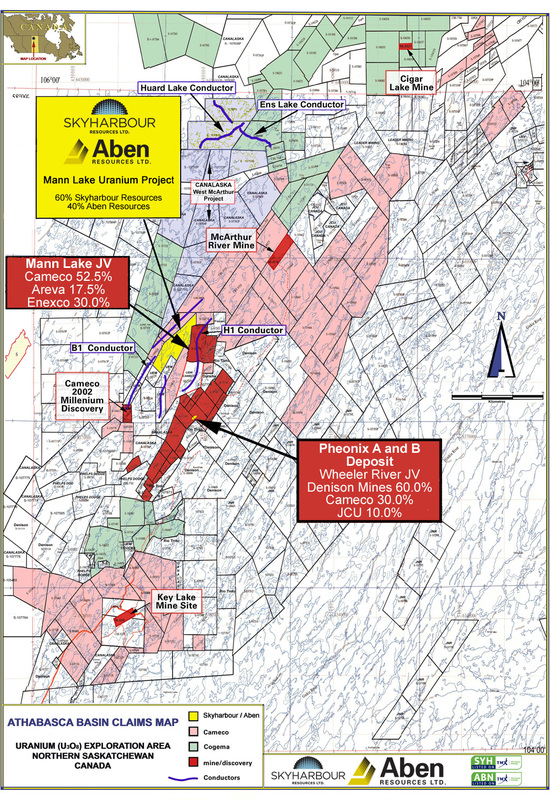 Triex/Canterra's Mann Lake property is also adjacent to the Mann Lake Joint Venture operated by Cameco (52.5%) with partners International Enexco (30%) and AREVA (17.5%), in which an aggressive 13,000 metre, 18-hole diamond drill program is slated to commence this month (see International Enexco's November 13, 2013 News Release). High-grade, basement-hosted uranium mineralization was intersected on this project during the 2006 diamond drill program, including 7.12% U308 over 0.25m and 5.53% U308 over 0.4m. The Mann Lake Uranium Project has seen over $3 million of previous exploration expenditures including recent geophysics and two diamond drill programs totaling 5,400 metres carried out by Triex in 2006 and 2008. The geophysical surveys identified basement conductors and structural corridors containing reactivated basement faults. These features trend onto the adjacent ground held by Cameco. The 2006 drill program intersected a 4.5 metre wide zone of anomalous boron (up to 1,758 ppm) in the sandstone immediately above the unconformity in hole MN06-005. Boron enrichment is common at the McArthur River uranium mine, and along with illite and chlorite alteration, is a key pathfinder element for uranium deposits in the Basin. In the same drill hole, an altered basement gneissic rock with abundant clay, chlorite, hematite and calc-silicate minerals was intersected about 7.6 metres below the unconformity, and contained anomalous uranium up to 73.6 ppm over a 1.5 metre interval. Background uranium values are commonly between 1 and 5 ppm. Jordan Trimble, President and CEO of Skyharbour, stated: "This acquisition enhances Skyharbour's portfolio of Athabasca uranium projects and complements the Company's flagship Western Athabasca Syndicate Project. The Mann Lake Uranium Project boasts highly prospective geology and geochemistry, and a robust discovery potential as identified by the historic work consisting of over $3 million in exploration expenditures, with additional work recommended on a number of untested targets. Of particular note is the property's strategic location southwest of the McArthur River Mine and adjacent to Cameco's Mann Lake Joint Venture where an aggressive 13,000 metre, 18-hole drill program is about to commence. Skyharbour's management believes this is an accretive deal for the Company's shareholders as we bolster our exposure to uranium on the east side of the Basin and add another catalyst to supplement our ongoing Syndicate work program in the Patterson Lake region on the west side of the Basin." The common shares of Skyharbour are issuable upon TSX Venture approval and will be subject to a hold period of four months and one day from the date of issue. The Mann Lake Uranium Project consists of one mineral claim covering 3,473 hectares located in the eastern Athabasca Basin in northern Saskatchewan. The property has been under a joint venture agreement with Aben Resources owning 40% and Triex owning the other 60% interest in the property. It occurs within the corridor that contains the richest uranium deposits in the world including Cameco's McArthur River Mine. In 1977, the Mann Lake property was staked by SMDC as part of the larger Cree Extension Project. SMDC conducted exploration work almost continuously with various joint venture partners until 1989. A regional hydrothermal corridor containing illite, dravite (boron) and chlorite alteration minerals was defined in the mid 1990's based on the analysis of thousands of samples of drill core and surface boulders from the Cree Extension Project. The Mann Lake property is ideally situated in the heart of this corridor. The property was optioned by Uranium Power Corp. and Pacific Amber Resources Ltd., who in 1999 conducted a reconnaissance, fixed loop TEM survey which detected four anomalies thought to indicate possible basement conductors. In 2005, Triex optioned the property from Consolidated Abaddon (now Aben Resources) and undertook a detailed ground geophysical survey to further delineate drill targets. In 2006, a first phase diamond drill program consisting of five holes was completed totaling 3,510 metres. Pervasive illite clay alteration was intersected over 90 metres of sandstone immediately above the unconformity in hole MN06-002. A 4.5 metre wide zone of anomalous boron (up to 1,758 ppm), was intersected in sandstone immediately above the unconformity which occurs at 631 metres in hole MN06-005. In the same hole, an altered basement gneissic rock with abundant clay, chlorite, hematite and calc-silicate minerals was intersected 7.6 metres below the unconformity and was found to contain anomalous uranium (up to 73.6 ppm) over a 1.5 metre interval. Background uranium values are between 1 and 5 ppm. Both drill holes were located near an east-west fault. A follow-up diamond drilling program consisting of 1,877 metres in three holes was completed in 2008 and a number of identified targets have yet to be drill tested. The technical information in this news release has been prepared in accordance with the Canadian regulatory requirements set out in National Instrument 43-101 and reviewed and approved by Richard Kusmirski, P.Geo., M.Sc., Skyharbour's Head Technical Advisor, a qualified person. Skyharbour Resources Ltd. is a uranium exploration company and a member of the Western Athabasca Syndicate which controls a large, geologically prospective land package consisting of five properties (287,130 hectares or 709,513 acres) in the Athabasca Basin of Saskatchewan. $6,000,000 in combined exploration expenditures over the next two years is planned on these properties, $5,000,000 of which is being funded by the three partner companies. Skyharbour also maintains a diverse portfolio of precious and base metal projects in the Red Lake district of Ontario. The Company has 43.6 million shares outstanding with insiders owning over 25% of the outstanding shares. Skyharbour's goal is to maximize shareholder value through new mineral discoveries, committed long-term partnerships, and the advancement of exploration projects in geopolitically favourable jurisdictions.